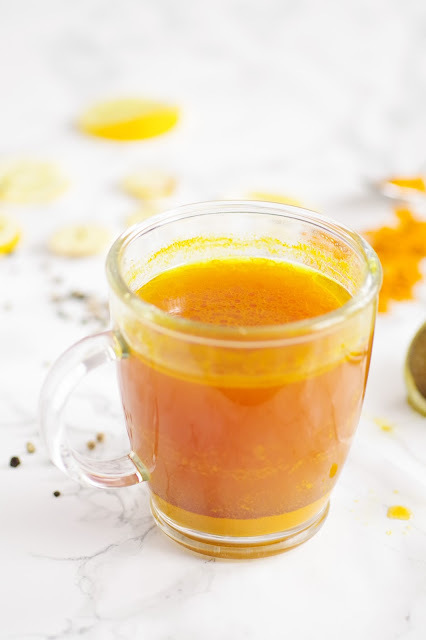 This next recipe is a miracle for when you're feeling under the weather, but can't afford to take time off work, a little cup of this immune-boosting tea that will make you forget you're even ill! A co-worker made something similar for me during my time at uni when I had a horrid cold, but I still had to show up to work - I drank a few of these on shift and I almost forgot I was even ill! I've ramped it up a bit, with a couple of extra ingredients, to make it extra good for you! 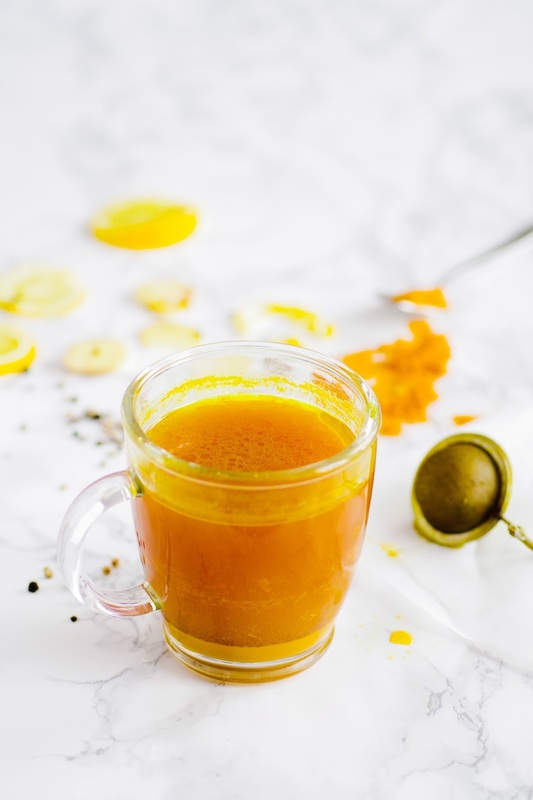 This anti-inflammatory tea is steeped with lemon, ginger, turmeric, black pepper, coconut oil and a squeeze of date syrup for a touch of sweetness. Packed with cold-fighting goodness and it tastes delicious too! 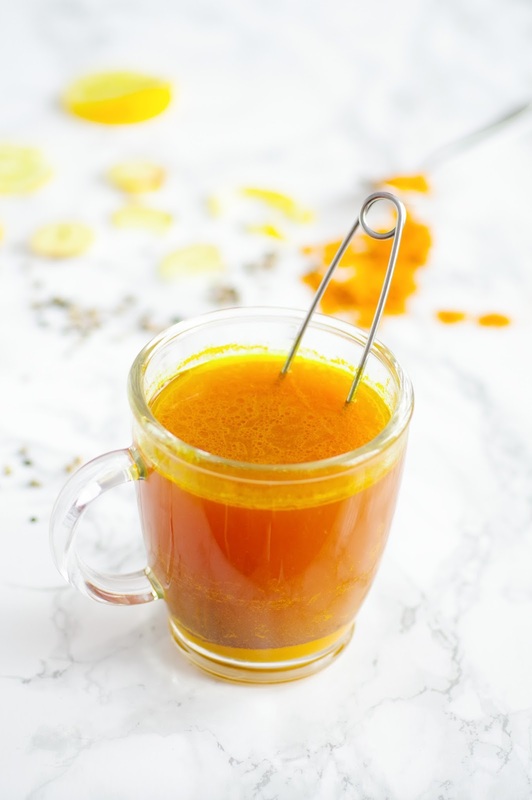 Many people rely on the classic combo of honey and lemon...until they go vegan of course and this soothing tea is my go-to for any time I'm feeling under the weather. I thought it was about time you all felt the magic, too! Ginger and lemon are a classic combo, lemon is rich in vitamin C, has anti-bacterial, anti-microbial properties and anti-inflammatory properties and quickly soothes a scratchy throat, ginger is also a fantastic anti-inflammatory, whilst also providing some relief to any nausea brought on by the illness. Turmeric is becoming increasingly famous for its powerful anti-inflammatory properties, though not all turmeric is created equal and some will have higher 'active' ingredients than others. Turmeric is not easily absorbed by our bodies, which is where the black pepper and coconut oil come in, 'piperine' - the active ingredient in black pepper has been shown to boost turmeric absorption by 2000%, it's also fat soluble, so adding a little coconut oil is helpful too. Coconut oil contains high amounts of lauric acid, responsible for increasing good cholesterol levels and helping inflammation...so whilst you shouldn't go overboard, it definitely has its benefits! Whilst you could drink this tea unsweetened, a little sugar isn't going to hurt when you're in need of a boost! I chose date syrup for my tea as it's been shown to have anti-bacterial compounds, shown to actually be more effective than honey, as well as containing anti-oxidants, making it an excellent sweetener for an immune-boosting tea! Boil the kettle with enough water for 1. Meanwhile, grate the ginger and roughly chop the lemon slices, place inside your tea strainer with the black pepper. 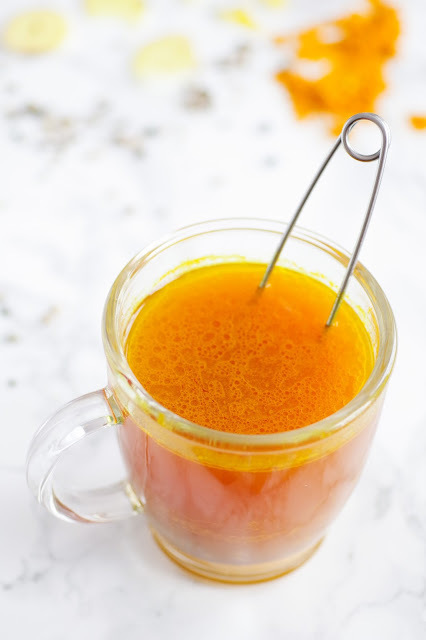 Place the turmeric, date syrup and coconut oil in the mug, pour the water over and stir until the coconut oil has melted, then put the tea strainer into the mug and leave to steep for a few minutes. Serve up and feel the warmth! Top the mug up a couple of times as and when needed with boiling water, adding extra turmeric, oil and date syrup as required and enjoy!